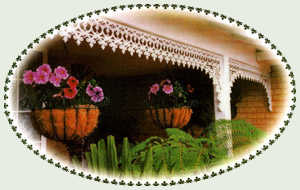 Add life to your carport, patio or veranda with the Patio Lace range of Broekielace. This elegant lacy patio trim is available in the decorative Victorian range or our modern feel Contemporary style. Both are available in Brilliant White and Heritage Green. Manufactured from UV stabilised polyprop (PVC).Therefore, it will not rust, corrode or yellow in sunlight. This dynamic product is not only lightweight and simple to install but is also cost effective and completely maintenance-free, offering you peace of mind. For simple installation and accuracy pre-drilled lugs have been moulded onto the trim. Utilise 4 mm (3/16 inch) screws and install onto your application. The Broekielace has a repetitive pattern making it simple to pattern match and to trim to your desired length. Use a handsaw.